Week 8 of the NFL regular season schedule has been completed, giving us an even larger sample size to delve into just how each of the 2018 NFL Draft first-round picks has fared in their respective action so far. Some of the 32 first-rounders have not qualified for a grade either based on small snap counts or not playing altogether. On the other hand, some players have jumped out of the screen and have helped strengthen their teams. Mayfield’s Week 8 performance against the Steelers was his lowest-graded performance in a Browns uniform to date, and it was, quite frankly, a fitting way to close out Hue Jackson’s tenure in Cleveland. Mayfield faced pressure on 43.6% of his dropbacks, which was a career-high for the first-year signal-caller, and he struggled to make plays as a result. Mayfield completed just 22 of his 36 pass attempts for 180 yards and ended the game with two turnover-worthy plays next to his name. He’ll look to rebound with a new coaching staff next week against the Chiefs. Like Mayfield, Barkley too was bottled up by the opposing defense and ended his Week 8 game with the lowest single-game grade of his career. Against a stout Washington defense, Barkley was held to just 38 yards on 13 carries, with only 15 of those yards coming after contact. He forced just one missed tackle on the day and averaged just 1.15 yards after contact per attempt, his lowest single-game marks of the season. The Bears’ stunting defensive front gave Sam Darnold a closing pocket to work from for the majority of the game, but the first-year signal-caller showed plenty of poise and displayed good decision-making in those less-than-ideal situations. Darnold was at his best when he was kept clean from pressure on Sunday, completing 12-of-18 pass attempts for 131 yards and one touchdown, but more importantly, he ended the game without throwing a turnover-worthy pass. Rookie cornerback Denzel Ward had an up-and-down day in Week 8 and was often covering star receiver Antonio Brown. Ward tackled Brown for a loss on a screen pass and also logged a pass breakup while covering the Steelers number one; however, Brown got the better of the rookie cornerback on a third-down conversion catch. Ward was also flagged for a defensive holding penalty against Brown on a go route. All told, he allowed five catches from six targets and yielded 37 yards and a touchdown pass. Once again, the Broncos’ first-round pick was an absolute menace in the pass-rush in his team’s Week 8 loss to the Chiefs, and he racked up a whopping seven total quarterback pressures on his 31 pass-rush snaps. 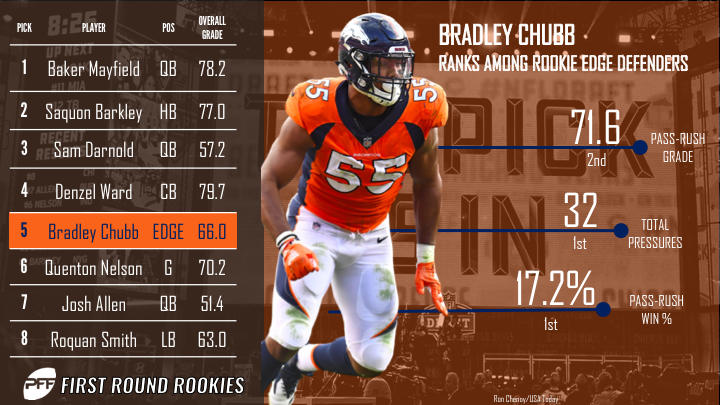 Through eight weeks of the 2018 season, Chubb has accumulated 32 quarterback pressures, which is the most among rookie edge defenders and tied for the ninth-most among all players at the position. His pass-rush productivity of 19.1 ranks seventh among all edge defenders with at least 50 pass-rushing snaps this season.